TerraGraphics plays a key role in a project demonstrating the feasibility of using a Mobile Atmospheric Monitoring Laboratory to quantify volatile air contaminants in real time with part per trillion to part per billion detection levels. These results are used in worker Health and Safety investigations. The mobile laboratory contains a Proton Transfer Reaction – Mass Spectrometer (PTR-MS) instrument using Time of Flight (TOF) technology. This work is being done in support of ongoing quantitative measurements of vapor emissions. The project goal is to implement selected vapor monitoring technologies that can be deployed to support plant operations related to real-time short duration vapor release events. TerraGraphics provides Project Management, subject matter expertise utilizing multiple Ph.D. Chemists, project Quality Assurance, and data processing, reduction, and reporting. As part of the Mobile Lab project, TerraGraphics has assembled a world class team of experts to process, manipulate, deconvolute, and report PTR-MS data. This allows for the rapid reporting of hundreds of chemical compounds with exceptional time resolution at part per trillion levels. Further mathematical workup of this data gives Health and Safety professionals statistical analysis of vapor concentrations, including max/min, means, concentration distributions, and comparison to Occupational Exposure Limits. Advanced data visualization tools are used to plot results in an easily useable form for clients. Using advanced analytical and computing algorithms, data is expressed with spatial and temporal resolution for a variety of chemical constituents at trace levels. TerraGraphics professional , Heath Low, was awarded a plaque for his leadership and dedication to building a bridge that continues to link students, educators, and the community to STEM resources through the Mid- Columbia STEM Network. TerraGraphics looks to continue their participation with STEM Like Me, and provide continuous effort to give back to the community. 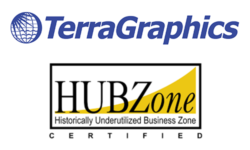 September 1, 2016- TerraGraphics is now a certified Technical Service Provider for the USDA Natural Resources Conservation Service (NRCS) in Idaho and Washington. With this certification, TerraGraphics can provide services to landowners in those states for projects being funded by NRCS.